Adopting a new best friend usually comes with an overwhelming sense of care. Many dog owners want to do everything with their new family member at their side and share everything. But here’s a warning: while your puppy may be able to partake in most areas of daily life with you, meal times can’t be the same. Dog food brands exist for a good reason: your puppy can’t have the same food that’s on your table. The developing body of any puppy requires nutrient-specific meals with the right ingredients at particular intervals. And, though a bit pricey, vet-approved dog food is always the best bet when it comes to raising a puppy. There is also much debate around puppies and snacking. While there is no harm in a treat or two, there are factors that need to be taken into consideration if you want to keep your pup healthy. 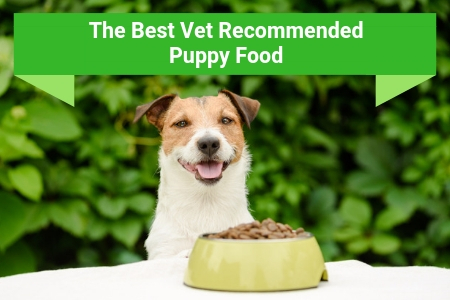 Use this comprehensive guide to get to know everything there is about puppy feeding and the best foods and ingredients available to you. Our pick of top five vet recommended puppy foods come with a list of pros and cons, making your selection super easy based on your unique circumstances. It’s your responsibility to ensure the safest, healthiest development for your puppy. Let’s explore exactly how you can make that happen. Why Should You Look For The Best Puppy Food? The developing joints, bones, organs, and muscles of a puppy require the aid of daily nutrients to adapt properly. These nutrients are delivered via specially formulated puppy food. Typically, puppy food contains twice the amount of nutrients and similar ingredients per serving when compared to the food of a fully-grown dog. Puppy food is also significantly higher in fat quantity. This is not found in adult dog food as it’s not good for older dogs to ingest so much fat. Puppies, however, need more energy to get through the day and this is obtained through consuming high amounts of fat. Feeding your puppy food that is nutrient deficient will have a noticeably negative impact on their development. From brittle bones to a weak immune system, the repercussions will be long-lasting and cost you a lot of money in the long run. How Long Should I Feed My Puppy This Type of Food? Technically, dogs are considered puppies right up until they reach their full-grown adult size, whether a toy dog or a large breed. Because of this, it’s acceptable to continue to feed your dog as a puppy up until it passes 80% full growth. After this, the shift to adult food can be made. There are, of course, instances where this timeline won’t apply. Depending on the growth rate of your dog you may need to make the shift earlier or later. Consulting with your vet will give you an indication as to the stage of your puppy’s development. There are instances where puppies may be receiving too much of a specific vitamin or mineral and the switch to a less nutrient-rich food becomes necessary. It’s all relative to your pet and their personal development. This is why regular veterinary check-ups are recommended. Is Moist, Semi-moist, or Dry Best? These are the three main types of dog food on the market and there is debate among dog owners as to which is the best suited for puppies. The truth is that moist, semi-moist, or dry food can all be beneficial for puppy development. So long as the food in question contains a balanced, nutrient-rich formula, then it will be suitable. That being said, moist dog food usually contains a much higher water to food ratio and will be naturally less nutritious than its counterparts. Moist dog food is, therefore, more suited to a fully developed animal who runs no risk of deficiency. If there has to be a winner then dry dog food comes in first. This is solely because it contains more protein than wet foods. It’s also one of the more cost-effective methods of puppy feeding. Dry food also has the added benefit of dental cleaning when the units create friction with the teeth. If you’d really like to promote your puppy’s growth optimally, then a combination of wet and dry food would be most appropriate. Top your dry kibble with any kind of wet food and just ensure the variations include all the required nutrients per feed. As a bonus, this habit keeps meals interesting for your pup. We are all familiar with the idea of treating a dog with human snacks. This is a widespread bonding experience between the owner and the dog. Being rewarded with treats is one of the simple pleasures so it’s wise to work it into your schedule. As with any animal, however, there is always the risk of overindulgence. Treats should be given wisely and sparingly so as not to upset the digestion of the dog in question. This is particularly important in the case of a puppy, as their digestive systems may not be properly developed yet. Unhealthy treating patterns can also lead to obesity and shorten the lifespan of the dog. While it can be tempting to hand over all table scraps to your dog after each meal, safety is the first priority. Here, follows a breakdown of the most responsible ways of treating your puppy. 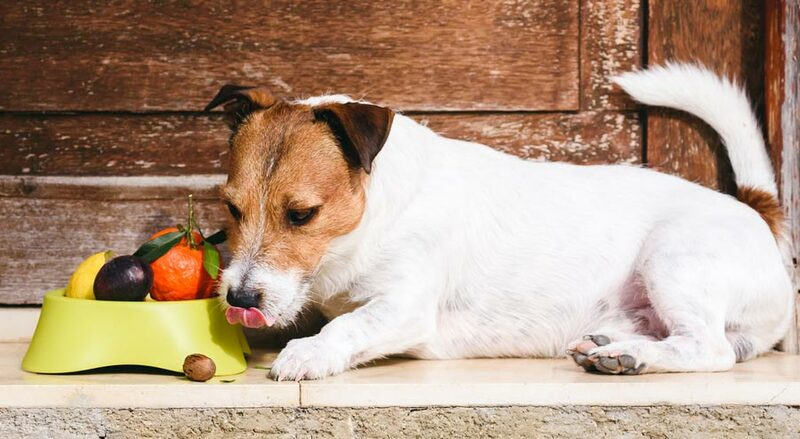 Are Vegetables Safe To Give My Dog? Vegetables, such as broccoli, carrots, and asparagus can make great everyday treats. They are suitable either cooked or raw. Should these snacks have been cooked in excessive oil, sauces, or dips, then it’s best to avoid feeding them to your puppy. Instead, opt for raw where possible; however, boiled is an acceptable alternative. Can My Puppy Eat Fruit? Most fruits are suitable as dog treats. Oranges, for example, contain ample vitamin C that can be absorbed by a puppy. When treating a dog with fruit, be sure to remove all seeds and pits. These can be damaging to teeth or cause choking. Not all fruits are safe for puppies. Grapes, for example, should be avoided at all costs. One or two swallowed by accident should be okay; however, more than this can induce instant kidney failure due to the intense acidity. If you’re looking for a puppy and readying your home for him, be sure that there are no accessible grape vines around your property. If a puppy gets access to any, they can die in a matter of hours. Usually, it's best to avoid this kind of snacking as much as possible. Starch-based treats such as potatoes, bread, or rice contain more calories than they do nutritious elements. The process of breaking down these treats is not worthwhile to the developing body of a puppy. It will require too much energy simply to ingest. Gravy-based starches should also be avoided. They are far too rich for the sensitive digestive tracts of puppies. Puppies should ingest dog’s milk—never from a cow. It’s that simple. Cows’ milk and mother dogs’ milk have very different nutrient & genetic compounds. Giving your puppy cow’s milk as a treat may seem enjoyable to them but it’s very difficult for them to digest later on. Consuming cow’s milk usually leads to diarrhea within a few hours. Plain yogurt may be made with cow’s milk, but the cultures in it make it easier on the stomach of a puppy. A little yogurt as a treat here and there isn’t a dangerous habit. Chicken, turkey, and lean beef can be great treats for puppies. Ham should be avoided, however, as it’s too rich for a puppy’s digestion. When treating your puppy with bits of meat, make sure that there are no traces of bones or splinters. These can be fatal if swallowed. Chicken tends to contain tiny bones that can easily go unnoticed. It’s better to just avoid this kind of meat as a treat where possible. When it comes to feeding and treating a puppy, table scraps should never make up more than 10% of their daily food consumption. If you’ve treated your dog today then subtract the amount from the rest of the food they need to consume and portion accordingly. Keep in mind that table treating a puppy is also a form of training. After repeated occurrences, the puppy will identify the correlation between table begging and being treated. If you’re not careful, your puppy will beg you forever after. This is why it’s important to not allow it to become a habit. Sometimes, it's better to avoid puppy contact with the dining table entirely. Treats and snacks can be added as toppers to the actual meal of the dog during feeding times. It’s also necessary to puppy-proof your food access points in your home. This is a means of ensuring that your dog isn’t able to go ahead and treat themselves if it wanders around at night or when you’re not at home. Food that is easily accessible poses a risk for a curious puppy on the hunt for a snack. This is particularly dangerous if the puppy is able to come into contact with foods that aren’t necessarily healthy for their consumption. Chocolate is a food item often left around the house because you may consume it in bed, in front of the TV, or at your desk. Chocolate is not good for dogs and can be fatal if consumed in large quantities, so be sure to hide it when there’s a new puppy (or any dog) in the house. Raising a puppy through to adulthood is not for the faint-hearted. The level of commitment, responsibility, and care that it requires can’t really be comprehended until it becomes your job. Taking interest in your puppy’s food intake is the first step to securing their happiest, healthiest existence. That makes all the hard work and attention to detail worthwhile. Happiness: Balanced, nutritious food that includes grain-free puppy food is a sure path to happiness for both your puppy and yourself. Health: Peace of mind that your dog’s development is taken care of with each meal that they ingest. Long lifespan: Knowing that your puppy will live out their optimum number of years by your side is worth the investment alone. Bonding: The pleasure of mealtimes is a bonding experience between puppy and owner. ​​​​Now, let’s help you pick your puppy’s new food items. 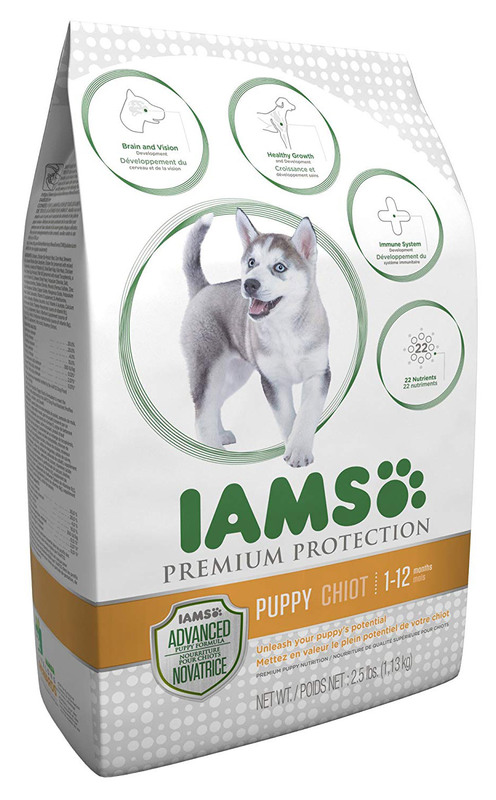 In spite of being a wet-based puppy food, this product from IAMS is balanced and nutrient rich for your dog's diet. Often, wet foods can contain up to 75% water content. This can replace valuable vitamins and minerals & make the food a bit deficient in nutrients in the diet of your pet. Luckily, this canned product by IAMS somehow manages to include all the necessary nutrients in spite of the presence of water. The food is also packed with omega fatty acids which are imperative to the healthy skin and shiny coat of a puppy. This is a tasty solution to mealtimes and the cans come in a range of meat-based flavors. The food represents hearty, home-cooked meals. The pellets are softened in a broth-like formula. The only downside with food like this is that there is little to no friction on the teeth during consumption and, therefore, no dental benefits to each meal. We love the range of puppy foods by well-respected brand Blue Buffalo. 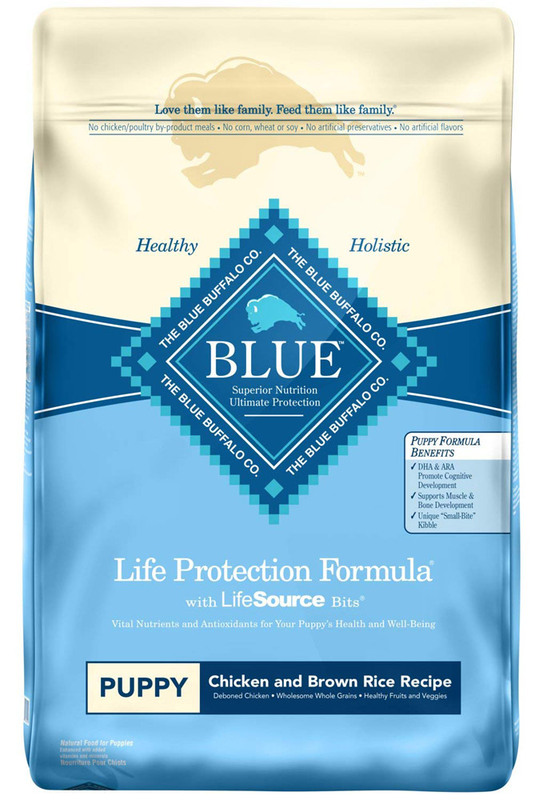 Blue Buffalo prides itself in helping you support healthy and holistic growth for dogs & puppies. This means they take all factors of development into consideration: body, mind, and spirit. This reflects in their product. They dub their puppy food as “a life-protecting formula” and look to set each animal on a path of longevity from day one. Aside from containing the necessary protein per serving, the pellets are also packed with dense quantities of fruit and vegetable elements. The minerals and vitamins that come from this kind of diet are unmatched. It’s not often that brands take fruit and veg additions so seriously. The presence of high levels of fruits and vegetables in dog food will lead to thriving immune systems. 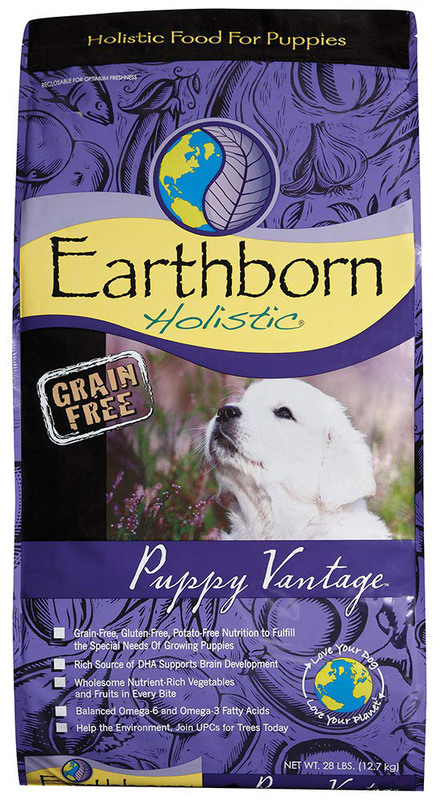 Earthborn is another brand worth a closer look for your beloved pet. The brand makes use of organic and sustainable produce wherever possible—this is not a common occurrence among dog food manufacturers. Their Holistic Vantage puppy food is specifically designed around the special needs of developing puppies. Omega-3, for example, is ample within this formulation in order to ensure proper brain and eye development. The brand also attempts to be as environmentally friendly as possible. Proceeds from each sale are donated to tree conservation projects that help the environment. Your purchase is an investment in your dog and in the planet’s wellbeing. 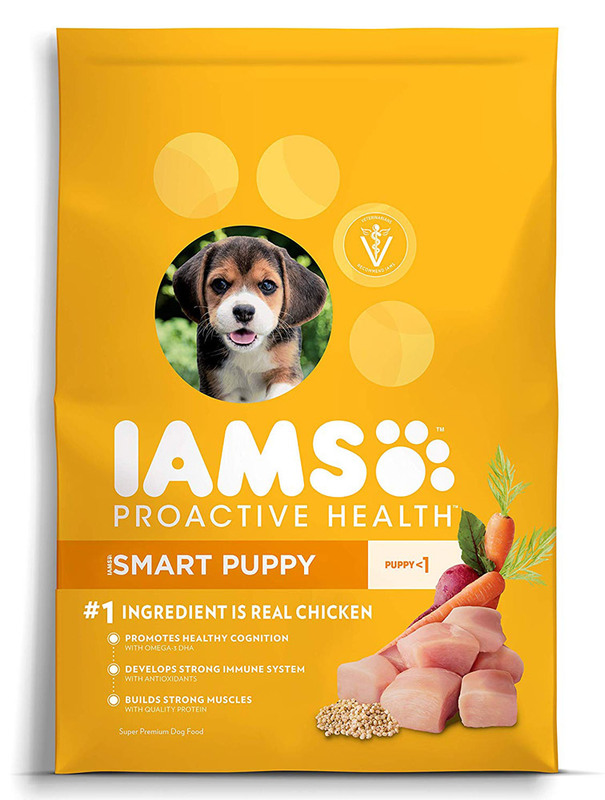 Another product by industry leaders IAMS—this is their dry puppy food. It’s ideal for puppies anywhere between one to 12 months of age. 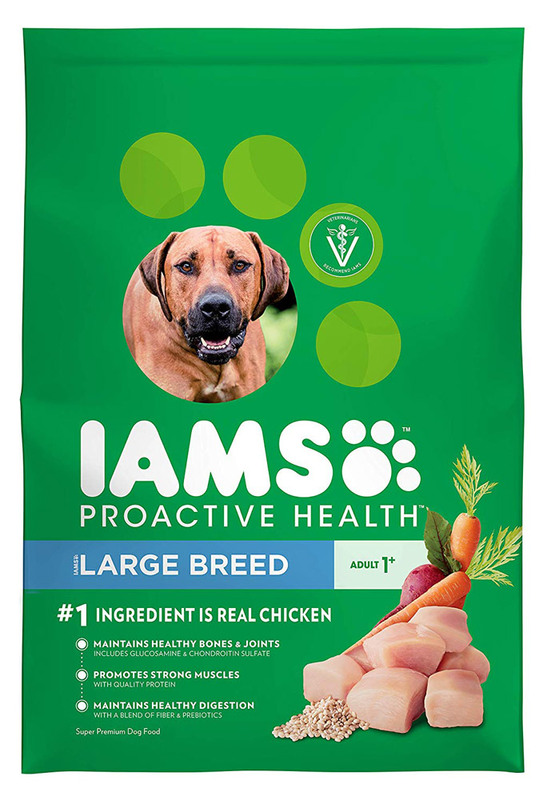 It’s good to know that IAMS makes use of real chicken (and other types of meat) in order to achieve their hearty flavors. There are no artificial flavorings in order to make the taste more desirable. Your puppy will crave the taste of real meat—nothing processed or fake. What’s great about this dry kibble is that it’s rich in antioxidants. This is an important nutritious factor that is often overlooked during manufacturing. Antioxidants are imperative for the development of a healthy immune system in your puppy. A deficit of these is what lands you dog at the vet every time the season changes. This premium protection puppy food is made up of an impressive 22 nutrient benefits. The food is targeted at puppies aged one to 12 months. There is specific focus around brain and vision development as well as healthy growth overall. In addition to this, the food helps to protect the jaw and teeth of the puppy. Regularly eating this food will create enough, valuable friction between the growing teeth of the animal and the food itself. Plaque is ground away and the rest of the jaw can develop without risk of cavities. This puppy food is balanced and contains sufficient minerals, vitamins, proteins, and carbohydrates for a healthy, happy pup. The only thing it may be lacking is sufficient fatty acids. However, adding a topper to this dry kibble can take care of that instantly. It’s an important job, but raising a puppy need not be a daunting task. With a little research and advice from industry professionals, your puppy will be well on its way to adulthood without complications. Selecting a vet recommended puppy food is an easy investment in your dog’s health. If you fancy having your puppy as fit as possible throughout his life, make the choice now: shift to a quality, balanced dog food today. Ultimately, it is your responsibility. Ask yourself: if you were a dog, what would you want out of your diet? 1 Why Should You Look For The Best Puppy Food? 2 How Long Should I Feed My Puppy This Type of Food? 3 Is Moist, Semi-moist, or Dry Best? 4.1 Are Vegetables Safe To Give My Dog? 5 Can My Puppy Eat Fruit?